Hello Wasatch Backcountry Alliance Members! We hope that you have had a good summer, but are guessing that – like us – you are tired of the heat and smoke and are looking forward to another bountiful winter! After a couple of years of relative inactivity, the Central Wasatch Commission (CWC) kicked into gear. Former SLC Mayor Ralph Becker – who was a driving force behind the original Mountain Accord process – was named the Executive Director of the CWC, and there’s also a small staff to help him out. As a reminder, the CWC was formed to basically be the formalized entity to execute the Mountain Accord. 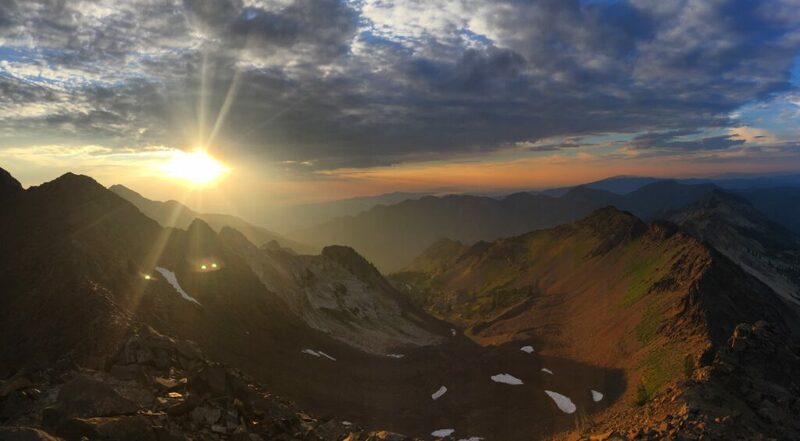 Here is a link to the Accord itself, which notably the Board of Wasatch Backcountry Alliance did not sign due to our concern that a canyon-to-canyon (LCC-BCC) connection possibility was left in place. Although the likelihood of that happening now seems reduced, but it has not been completely eliminated. The CWC organized an outing dedicated to taking staffers of the Utah congressional delegation and some key stakeholders in the CWC on a tour of the two Cottonwood canyons. Representative Mia Love has shown a strong interest for re-introducing the Central Wasatch National Conservation and Recreation Area (CWNCRA) act to congress. The CWNCRA would formalize many aspects of the Accord, though the bill will likely not be introduced until 2019 at this stage. There were representatives of Love’s DC and UT offices, and reps for congressmen Stewart and Curtis and Senator Lee. There was also a representative from the House Natural Resources Committee, which UT’s congressman Rob Bishop chairs. WBA participated in this tour, along with the governor’s Outdoor Recreation office (Tom Adams), the head of DEQ (Alan Matheson), Forest Service representatives Chad Henson and Lance Kovel, Salt Lake City Public Utilities director Laura Briefer, and many other civic and environmental leaders, as well as representatives from the ski resorts (notably, Alta Ski Area was absent). This was a great opportunity to show the folks who are actually going to be writing the bill the lands at stake in the bill. As we mentioned in the early-summer update, The Big Deal with regard to the backcountry is that Alta Ski Lifts (ASL) has elected to take Grizzly Gulch out of any potential negotiations for land exchanges that will be authorized by the CWNCRA. ASL purchased a large swath of Grizzly Gulch in the early 2000’s and has run a cat skiing operation there for years. In the Accord, ASL agreed to potentially trade Grizzly, as well as other lands they own, into public lands if they got a connection to BCC (either a train or an aerial), a transportation solution for LCC base lands for commercial and retail development, plus water for both the development and snowmaking. We have met with ASL numerous times to discuss their role in the CWNCRA. We have been told that they want to retain Grizzly in order to – in their words – be able to keep up with the projected growth in the valley, despite the fact that national ski industry day visits have been flat for 40 years. To accommodate that potential growth, ASL wants to put a chairlift up into Grizzly Gulch. It is important to note that while ASL owns the south facing slopes in Grizzly (ie. the Michigan City area) they do NOT own the iconic Patsy Marley peak or much of the land in Patsy Marley bowl. They do have a special use permit for avalanche control on the south face of Patsy Marley, and it also extends over onto the north side (and part of that permit is signage and the ability to close areas within the “kill zone” of the artillery used in the control work). Importantly, they also do not own a large swath of aspens at the mouth of the GG trailhead; this is a significant swath of Forest Service (ie. public) land that is right in the path of Alta’s preferred lift alignment from their existing base facilities into GG. We will continue to meet with ASL to discuss solutions that can work for them as well as the backcountry community. We met with the Forest Service district ranger Bekee Hotze, and were able to hike with her up into GG. During this tour of GG we looked at various aspects of the GG terrain and implored how important it is to the community for it’s relatively avalanche-safe and easily-accessible terrain, plus as a gateway to areas such as Silver Fork and Mt. Wolverine. Bekee made the strong point that the public views the FS as being a steward of mountain lands and she takes that responsibility very seriously. We also met with Solitude recently. They were purchased by Alterra Mountain Company this summer to compliment last year’s purchase of Deer Valley. We were assured that Solitude will continue to act independently and still stands by the Accord. We have been concerned about their desire to change the Honeycomb Return chairlift alignment into the bottom of Silver Fork, which would effectively make upper Silver Fork side country, but this appears to be on their back burner for now. The next CWC meeting is September 17th and the public is invited. We will send out a reminder about this, because the more people there to support the backcountry the better. Previous meetings have had many protesters there who favor MORE backcountry development in the Cottonwood canyons, so a good turnout will be critical. And finally: The fun stuff! Events! We’ll do another member meeting this fall (mark your calendar for Thurs., Oct. 25 6:30 p.m. at the Patagonia Outlet in Sugarhouse), as well as our famous Powder Party, likely again hosted by Red Rock Brewing. We are going to be the beneficiary of the Utah Adventure Journal’s Wasatch Speaker series at Snowbird again this year, and as always there will undoubtedly be a great lineup of speakers about every other week during the season. We will share more info on all of this as dates are firmed up, and don’t forget the annual fundraiser party for our friends at the Utah Avalanche Center on September 13th.